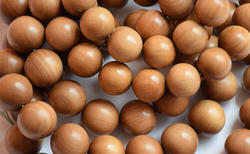 Sandalwood Mala loose beads are a string of beads used to count mantras in sets of 108 repetitions. 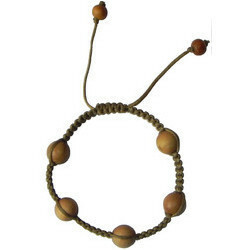 The large “sumeru” (mountain) bead provides a starting and ending point on the mala for counting the repetitions. 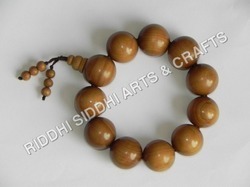 Sandalwood Mala beads are an ancient tool that was developed to keep the mind focused on the practice of meditation. 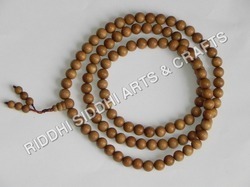 The Mala is a Buddhist rosary or a japa mala. There are usually 108 beads on a mala signifying the 108 invisible threads from each person to the divine in Buddhist teachings. Chanting a mantra 108 times awakens these threads and aids meditation. 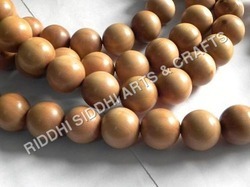 The idea of mala beads is so the person using them is able to concentrate on prayer and meditation. This saves them counting the number of times a prayer is said while praying. The end of each Mala is marked by the Buddha bead. 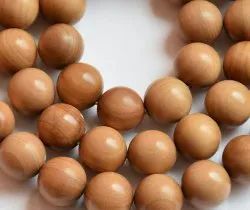 The mala is used so that one can think about the meaning of a prayer or mantra with sincerity, devotion and full attention, while it is being chanted. Each time the mantra is repeated, the fingers move to the next bead. 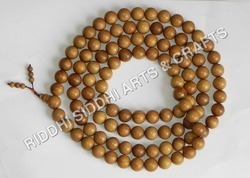 Many believe that when a mala is used in this manner and after repeated use the mala takes on the energy of the mantra. There are varying explanations of the significance of the 108 beads that are in this necklace. One of them being that 1 stands for God or Higher Truth, 0 stands for emptiness or completeness in spiritual practice, and 8 stands for infinity or eternity. Another explanation is that the two sacred numbers of 9 and 12 when multiplied total 108.